The morning after our kickoff meeting, on Friday, July 21, we traveled to Plymouth, MA, to visit a replica of the original Mayflower, called the Mayflower II. There were a number of displays set up on the dock alongside the ship telling about shipboard life in the 1600's. We were then able to go aboard the ship and wander through its various compartments to get a feel for what it must have been like for the Pilgrims who spent about two months aboard crossing the Atlantic. This was after having lived aboard for several months due to a couple of false starts. Since they arrived late in the year they continued to live on the ship until spring. The Mayflower was a small ship and clearly must have provided extremely cramped and uncomfortable accommodations for the approximately 130 people on board. As we toured the ship staff members, some in period dress and acting their parts, described shipboard life and the operation of the ship as well as providing history of events leading up to the voyage and following the arrival in the New World. 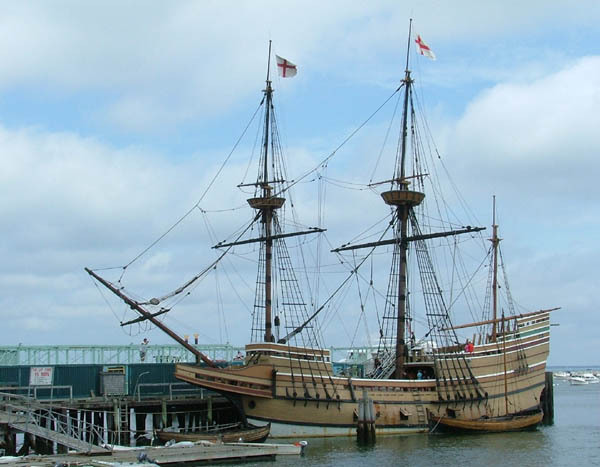 Our visit to the Mayflower II was interesting and educational and, hopefully, enjoyed by all who attended!